EMERGENCY RALLY: T.O. POLICE SHOOT 18 YR OLD BOY! Dec 15th 2013 | C.O.B.P. 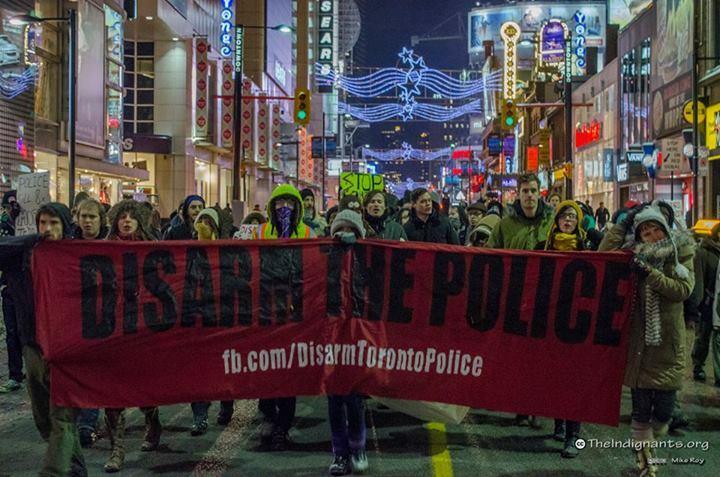 On Friday, Dec 13 at around 8pm, FOUR Toronto police officers shot an 18 year old boy in a crowded subway station. He is currently hospitalized and listed as being in stable condition. An emergency rally was held on Sunday, Dec 15 to demand the disarming of frontline police officers. The rally meet at 55 Gould St and march to Queen Station. When at the Queen station activist burned an effigy of a pig, then the crowed dispersed when a firetruck arrived. Estimated 60-80 people.. The police have killed 15 people since August 2011, 8 of them shot to death. In every case, the victim did not have a gun. Meanwhile, a cop has not died on duty from anything other than a vehicle accident since the 90's.